This is an Apricot wheat ale and was initially just a seasonal beer for McAuslan. The overwhelming success of this beer forced the breweries hand and shortly afterwards this became a year round speciality. Apparently this is the beer to have with curry, one of my favourite foods, so I will be sampling this first on it's own and then with the curry. Hopefully my beer guy wasn't lying to me! 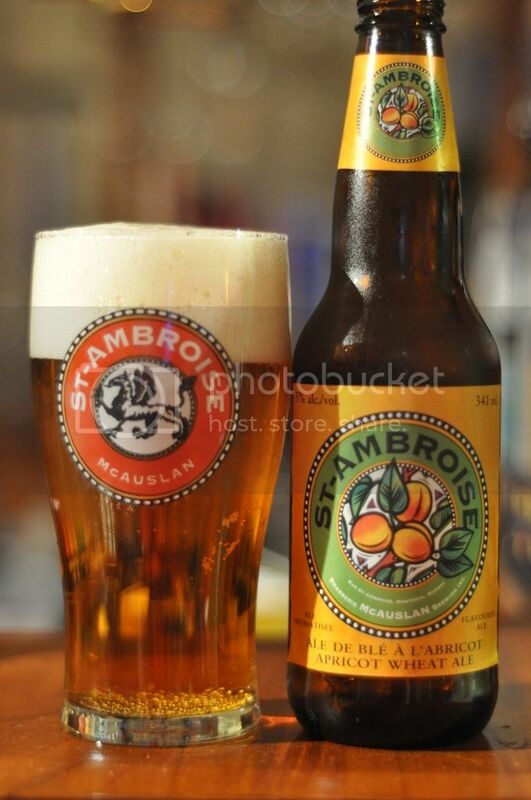 The St. Ambroise Apricot beer pours like lager, a welcome change from some of the other fruit beers that we have come across. I would call the colour peachy, it's a clear slightly dark golden colour. The head is shortlived, but large and bubbly. The colour of the head is ever so slightly orange tinted, and I imagine this is from the apricot. There is good lacing despite the pour head retention, it's a good looking beer. Naturally this beer smells like apricots on the nose. What else would an Apricot Wheat Beer smell like? It's very sweet and almost entirely made up of apricots, however there are hints to the fact that is a wheat beer. I can just make out hints of vanilla and even some grain. There are no detectable hops on the nose, and in a beer like this I'd be extremely surprised if there are any when I taste it. When I taste this beer it's pretty easy to see why this beer has a reputation for being good with curry. It's a very light and refreshing! The beer starts off surprisingly tart for something that smells so sweet, before a sweeter juicier apricot flavour shines through. You can tell it's a wheat beer, but it doesn't have that unusual mouthfeel that many German examples leave you with. The finish has an almost tangy feeling to it while retaining the fabulous fresh apricot taste. This beer is delicious and would be incredible on a hot summers day! I wouldn't recommend a heap of them though, even after 2 it was getting a tad cloying, it's a bit too sweet. However McAuslan's fruit beer certainly shows off the fruit well, you can really taste the fresh apricot flavour. And as for the curry taste test, it's also a winner there. It helps soothe the intense flavour of my very hot vindaloo. Overall this is a solid fruit beer, and one I will probably buy again. Definitely worth a shot if you can find it!